Note: Recommended replacement product may not be an exact feature match - they may include enhancements. Please review the product literature or talk to your pool professional. 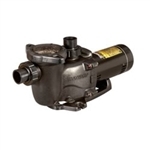 Raises your Tri-Star pump 1" for install to replace Northstar Pump.